It took me way too long to make this card! My 4 year old must have interrupted me a million times. I just could not get this card together. I'm so glad I did get it done though. I sent him upstairs with some grapes to watch a movie and I knew that'd do the trick. He LOVES his grapes, he gave me just enough time to put it together and post it here. I made this card using the sketch challenge over at SCS. It's Wednesday so it's sketch day! I love sketch day even if I don't do every single sketch. When I'm stuck on a design I always head over there to look at the master thread to find a sketch I would like to use. Now onto the card details: Pink Passion was used for card base, Green Galore matted on top. I used the Polka dot cuttlebug embossing folder on the Green Galore to give it a little something. 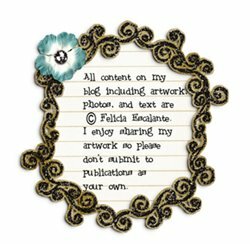 I found this awesome paper by American Crafts called Celebration Fortune Teller. I love this paper!! You can't really tell but the stars that look black are actually a dark purple. It's so fun and cheery! I love fun and cheery. 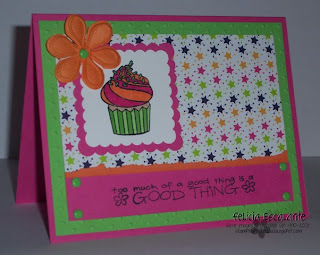 I used my Lizzie Anne Designs stamp "Hey Cupcake." 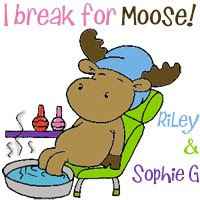 I used the sentiment from Time Well Spent by Stampin' Up! Added some green brads, and a orange Prima to finish it off. Thanks for looking!